An update on Kukyona’s XNA Terrain component – Shadow maps! p.s. I’m still working on Part 2 of my XNA Collision Detection tutorial. New XNA blog to watch – Alpha Blending explained! Shawn Hargreaves seems to be blogging with a vengeance today. Possibly going for some kind of record. Anyway, among other things, he alerts us to another XNA Team member’s blog: Eli’s Cornflower Blue blog opens with part 1 of an article explaining Alpha Blending, how it works, and it’s relationship to the Depth Buffer. I’ve only skim read it so far, but it looks like some very good info. Exactly what the doctor ordered actually, because when I was converting from XNA Beta 1 to 2 I had all sorts of problems with weird Alpha Blending symptoms. All fixed now, but I never really understood the problem. I’m looking forward to studying this one ASAP. XNA & HLSL Tutorials – what would you like to know? Many people discover my blog while searching for XNA & HLSL Tutorials. To be honest, I’m probably as much a beginner as most of you. I do know your pain though – it’s damn hard to find an HLSL tutorial pitched at a beginner’s level. That is why I blogged when I finally discovered some promising resources. I’m planning to update this blog occasionally with whatever HLSL learning’s I uncover. They will likely fall short of what you’d call a tutorial. More likely they’ll be sporadic little journals sharing my HLSL findings as my own understanding grows. I’ve also been in contact with the operator of the Riemers site. I’ve linked to his HLSL tutorial before and no doubt a few of you are finding it an excellent resource. He plans to update or include more beginner’s level HLSL tutorials and has welcomed any feedback or ideas from me. I’ll be giving him my own wish list at some stage. If you have any particular ideas or wishes, please leave a comment here, and I’ll be sure to pass them his way. So what would you like to see in a beginner’s level HLSL tutorial? Go ahead and comment! Progress > Hooray for XNA & HLSL. Lighting for any occasion. Just a quick update tonight. Things are progressing very well. I’m nearly back to the point I was at before rewriting for XNA. Just the shooting to add and some minor glitches to fix. However, along the way, I couldn’t help but throw in something new. So here’s a quick peak. Thanks to the joys of Refactoring, XNA, HLSL (shaders) I now have I nice wee system for changing the look of the game for different environments. 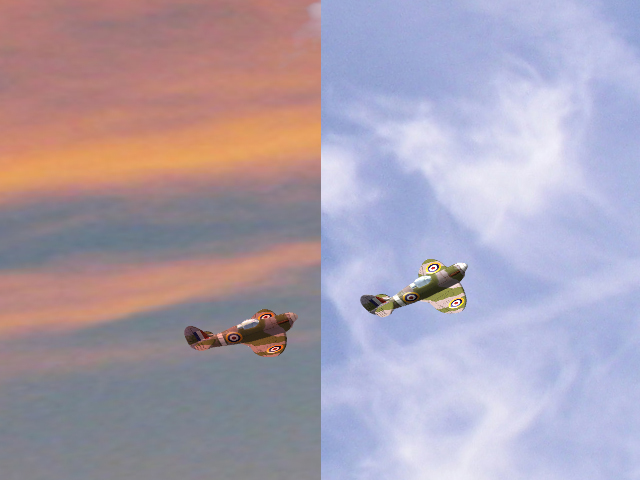 Click for a comparison screenshot showing the Spitty in bright daylight vs moody dusk. In particular, check out the way the lighting of the model itself is different. Also note the glossy Cockpit. Difficult to appreciate with a still image, but in game you can clearly see it’s of a different material to the rest of the plane. Not transparent, but I don’t think it really needs to be for this game. I’ve designed things such that I can switch between the two environments with one line of code!!! Just a quick update on the Game dev progress. Rewriting for XNA has been keeping me busy. Up till a couple of nights ago, it had felt very much like back to square one. I’ve finally got past the initial slowness, and am starting to make forward progress again. The seriously stripped down XNA sample code is starting to feel like my own at last. I actually know where to look for stuff now without needing to search unfamiliar code. I’ve integrated my Spitfire model. So far, I’ve got by with the sample HLSL shader. By looking at the sample code, I’ve also worked out how to make the Cockpit look glassy. Not exactly transparent, but more reflective and probably good enough. I’ve converted over my code for the movement, so the Spitty now flys and turns as it did before. Incorporate or rewrite my Skybox code for the background. Then it’ll be time to incorporate some SHOOTING to keep the punters happy. Oh, and I have this week off work, so between holiday activities I’m hoping to get some good progress done! I haven’t even studied the last ones yet, but this one looks like a good starter for Pixel Shaders specifically. I mentioned earlier that the new XNA framework requires you to do things with Shaders, where before you didn’t have to. This is all good, but yet another new thing to learn. So I’ve been googling quite a lot lately. I can’t believe what a struggle it has been to find a decent beginner level tutorial out there!!! Last night, I think I may have finally stumbled on a couple. I’ll look into them in the weekend, but they did at least start like a tutorial for beginners like me. They are not XNA specific, but I don’t think that should matter. HLSL is not new, and it is a DirectX language – not C#. One of them appears to be an excerpt from a book, and I don’t know how old or how relevant it is to DirectX 9’s HLSL. excerpt from some mystery book…I think?!?!? You are currently browsing the archives for the HLSL category.